Grand strategy by numbers—lots of them. In Rome, civil war is brewing. In the capital an ambitious politician called Gaius Fabius has become disloyal, and I imprison him to stop his advance to power. I make audacious claims on neighbouring provinces, which gives me casus belli to steal their land with a roaming army of 44,000 men. But all the while, from jail, Fabius spreads nasty rumours about Rome’s current ruler, Maximus Rullianus, threatening to destabilise the entire republic. Imperator: Rome is a grand strategy game of remarkable scope. It’s set during the classical era, marking the rise of some of history’s mightiest historical forces, but you can take charge of nations large and small. At a preview event last week I ruled Rome, Egypt, and a small Germanic tribe on the edge of an unconquered forest. Each had their own system of government to meddle with, and they were all populated by ambitious, flawed characters, vying for power. If you've played Paradox strategy games such as Europa Universalis 4, Hearts of Iron or Crusader Kings 2, you will be familiar with the real time-with-pause format of Paradox’ Clausewitz engine. Using an array of icons at the top of your screen, you can tweak your government, economy and military. Pop-up events let present crises to muddle through, and armies move around the map, deleting one another in autoresolved combat. More than anything, Imperator is a numbers game. The interface shows scores for faith, military might, political sway, stability, tyranny, manpower, and money. Juggling these is your primary task. Build markets, tweak taxes, raise armies, and decide what sort of nation you want to rule. Imperator feels huge and somewhat directionless. It’s daunting to pick a world power with no specific objectives, but Imperator is a pure sandbox. The impetus is on you to create objectives and form plans, and you need to do some work to excavate these neat stories of betrayal from screens full of stats. The game can simulate epic tales, but they don’t necessarily surface when you’re busy thinking about which integration policies to enact on your newly-conquered territories. Maybe that’s as it should be. Running a nation ought to be a messy business, and things get very messy in the Roman senate. Three of the four factions there give you boosts to an aspect of your nation if they are in power, but the fourth faction—the populists—make your nation inefficient. They are also an unpredictable voting bloc. When I tried to declare war on my neighbours to the south they refused to vote it through the senate. How dare they? I had to brute force some votes to get my war, which earned me a few ‘tyranny’ points in the process. Maybe I’d feel more at home running a monarchy instead. 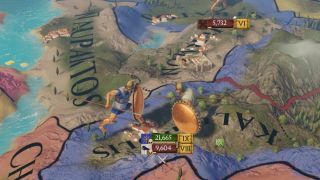 Imperator lets you take charge of kingdoms, and even migratory tribes. I was impressed with how different each nations felt. Egypt can use the Nile to generate great wealth, but the sparse southern deserts create barbarian hordes and, in my playthrough at least, the Phrygians marched south and battered me. Running a smaller Germanic tribal nation felt different still. They struggle to generate wealth, so every expenditure matters and they need to make tight allies in the region to avoid being conquered. The military side of the simulation is relatively slim, which is a relief considering how much admin goes into propping up everything else. You build stacks of units, assign a capable general (keep an eye on their loyalty) and then push your armies into territories to occupy them. Once you have occupied the territories you want, you sue for peace and claim them as your own. Your armies resupply using your nation’s ‘manpower’ stat, which you can boost by building training camps, researching tech, and supporting characters with manpower-boosting traits. That’s what it all comes down to in Imperator: Rome—crunchy stats, and lots of them. But give it enough time, and, squint real hard, and you might start to see the movements of nations striving for greatness in a massive, detailed simulation. We'll have to wait and see how the AI holds up under more prolonged exposure, but the sheer density of nations you can control will make it an almighty time sink. Just prepare yourself for a lot of menu fiddling. Imperator: Rome is due out next year.